a. The car must have been made during the current year. b. The width of the car shall not exceed 2 3/4 inches. c. The length of the car shall not exceed 7 inches. d. The weight of the car must not exceed 5 ounces. e. Minimum width between the wheels shall be 1 ¾ inches so the car will clear the center guide strip. f. Minimum clearance between the bottom of the car and the track shall be 3/8 inches so the car will clear the center guide strip. g. The wheelbase (distance between the front and rear axles center to center may not changed from the kit body distance of 4 3/8 inches. h. All car parts i.e., axles, wheels, and body wood shall be as provided in the BSA Approved kit. Parts from all other sources will not be allowed and will subject your car to immediate disqualification. i. Wheel bearings, washers, and bushings are prohibited. Axles may be lightly sanded and polished. This will be the only wheel modification allowed. j. The car shall not ride on any type of springs. k. Wheels can be sanded to remove surface imperfections, but the treads must be left flat. Cars with less than 1/4 inch flat tread will not qualify to the race. l. Graphite is the only lubricant that can be applied to the wheels. m. Details may be added as long as they are securely fastened (not loose) and must be within length, width and weight limits. o. No loose materials of any kind (such as lead shot or mercury) are allowed in the car. p. Once a car is registered to race, it cannot be handled by anyone other than race officials. q. The Pinewood Derby Inspection Officials have the right to disqualify cars that do not meet the rules. Car owners will be informed of the violations and be given an opportunity to correct the car to meet the rules. r. Ungentlemanly or unsportsmanlike conduct by any participant or member of the audience will be grounds for expulsion from the competition and /or race area. s. The Track Master has the final word with regard to the races. 1. Go to the vehicle inspection station for your preliminary inspection and to register for the event. 2. Photo of you and your vehicle will be taken. 3. If you need to make some minor adjustments to your vehicle before final check in please proceed indoors to the Pit Crew Table. 4. Final Weigh in, no alterations after this. Your vehicle will be placed in the carport to await the races. 5. Next you must become a licensed Pinewood Driver. 6. Proceed inside the Hall to the Eye Test station. 7. Then Proceed to the Written Test station. 8. Once both tests have been passed proceed to the Temporary License station to get your Pinewood Drivers Permit. 9. Visit the snack bar. 10. 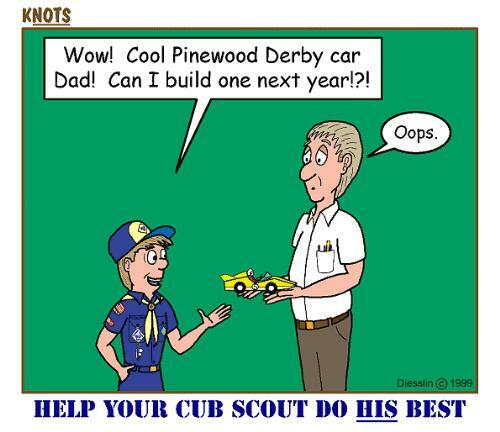 Lastly, get ready to cheer for yourself and your fellow Cub Scouts!